RockIT Repairs™ Inc. a local Veteran Owned small business would like to wish all of its customers a Happy Thanksgiving! This Black Friday through Sunday (11/24/17-11/26/17), we will be offering $15 off ALL repairs at both our Fredericksburg and Stafford locations. We are also extending our other Black Friday week specials through 11/26/17. 1. $100 gift card for only $85 special. You can pick up your gift cards in store or you can now order online and we will ship to you for free! Click here to order your gift cards online now before our Black Friday special ends! 2. 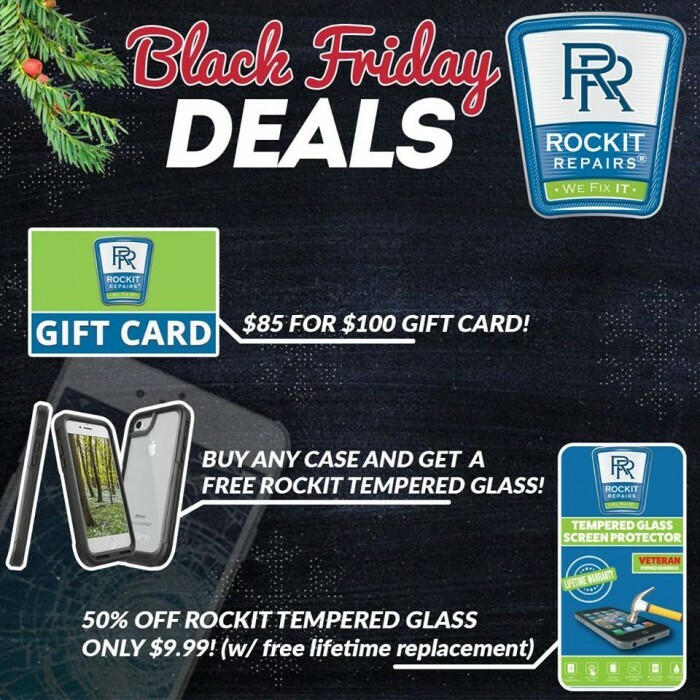 50% off RockIT Repairs™ tempered glass. Includes free lifetime replacement. Was $19.99, now only $9.99! 3. Free RockIT Repairs™ tempered glass with the purchase of any case.